Shortly you will receive your first issue of Proffe's Trend Portfolio as part of your 30 DAY FREE TRIAL OFFER! After receiving your 5 free issue you can make up your mind - it's that simple! After your 30 day Free Trial with NO OBLIGATION we will contact you and if you decide that you wish to continue receiving Proffe's Trend Portfolio and only than we will ask you to enter your payment details. 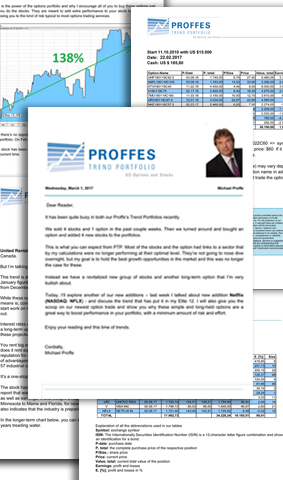 You can continue to receive Proffe's Trend Portfolio for just $999 per year. Please do remember that Proffe's Trend Portfolio generated an average of 40% ROI in the past 6 years. That means that the subscription cost is quickly earned back! Title -- Please Choose -- Mr. Mrs. Company Miss Dr. Prof.
Are you a company Please mark if "yes"
© Copyright 2017 Michael Proffe. All rights reserved.